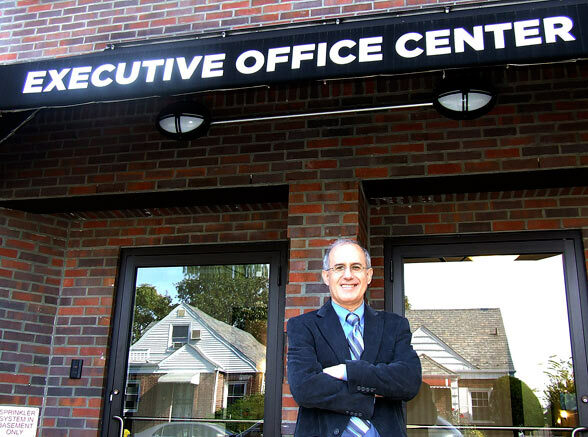 When Jack Blumner and his brother, Steven Blumner, opened the Executive Office Center in Fresh Meadows one year ago, all they had was a dream. Now the center, which provides temporary office space for up-start companies and professionals such as attorneys, contractors and realtors, has 75 tenants, including 16 permanent ones. The building where the center now stands was constructed in 1990 and was the home of First Choice Real Estate, the borough’s top residential real estate company, until it was sold to the conglomerate NRT Inc., which closed in August 2009 and sold the property to the Blumner brothers. The brothers renovated the building before opening it as the Executive Office Center Oct. 7, 2010. Jack Blumner said the space is used by up-start companies or other professionals in the early years of their careers who need to keep a professional appearance. The center uses a tiered pricing model and gives you access to office services, such as a mailbox, personalized reception service, telephone service and a conference room, depending on which tier you choose. “I think [the center is] perfectly suited to Queens because of the thousands of small businesses in Queens,” Blumner said. In addition to 16 permanent tenants, the center has 60 “virtual” tenants that have the opportunity to use the office on an a la carte basis. “This becomes a branch office for them, but not a permanent branch office,” Blumner explained. He said the center is ideal for attorneys and realtors who need to meet clients. Reach reporter Howard Koplowitz by e-mail at hkoplowitz@cnglocal.com or by phone at 718-260-4573.